We can help prepare your business for the upcoming changes. Single touch payroll (also known as STP) is currently one of the most talked about topics for all companies across Australia. As the changes will impact all businesses, it is vital to be clear on what you should do and when to start acting. At Kilimanjaro, we understand how challenging new regulations may be. We have put together answers to the most frequently asked question about the Single Touch Payroll. If your concerns are not listed below feel free to contact us and we will get you in touch with our Payroll experts to assist you. Single Touch Payroll (STP) is a new way for a business to report their employees’ payroll information such as Salaries and Wages, PAYG and Superannuation directly from the payroll software to the Australian Tax Office. As a result of Single Touch Payroll, business will no longer be required to complete payment summaries at the end of the financial year as the reporting will have already been done and available to employees through myGov. Single Touch Payroll (STP) will be mandatory from July 1, 2018, for business with 20+ employees, and July 1, 2019, for all businesses. What will happen for employees? Single Touch Payroll (STP) will allow employees to access their tax and superannuation information, such as their payment summary, through their myGov portal, If your employer does not run Single Touch Payroll, they will still be required to send through regular pay slips. What is expected of employers? Employers will have to establish how many people are employed by your business on April 1st, 2018. If your business has 20 or more employees on this date, you will need to upgrade to a payroll system that supports Single Touch Payroll by July 1, 2018. Companies with 19 employees are also now required to report through STP according to the passage of legislation from July 1st, 2019. Employers will run Single Touch Payroll under a Standard Business Reporting-enabled software which enables reporting of payroll and superannuation information electronically, at the same time that their employees and superannuation funds are paid. Employers are required to upgrade their existing payroll software to satisfy the Single Touch Payroll standards. Download this checklist to make sure you are prepared for the upcoming changes. How can employers smoothly transition into Single Touch Payroll? Once the above steps have been completed, employers must consider when and how they should transition into Single Touch Payroll. An employer has the option to begin using Single Touch Payroll now, which means some employers could be completing their EOFY processes in a quicker, more efficient way. When an employer starts using Single Touch Payroll, the system will submit existing YTD amounts of both current and inactive employees in their first submission. What will change with Single Touch Payroll? For employers, Single Touch Payroll will ensure your business is compliant with the ATO’s new reporting requirements. The new system allows employers to report data correctly through the ATO with no added work. For payroll software providers, Single Touch Payroll provides a simple way to incorporate the new system into the existing one with no extra cost. Does MYOB Exo Employer Services support Single Touch Payroll? MYOB Exo Employer Services is going to support Single Touch Payroll by providing a specific workflow. MYOB is readily equipped and plans to improve current reporting functionality to support the submission of Single Touch Payroll reports directly to the ATO. Single Touch Payroll “pay events” will become readable to support the review of data as part of the submission process. MYOB is well prepared to integrate Single Touch Payroll functionality and submitting data directly to the ATO will become a simpler, secure and an automated process. 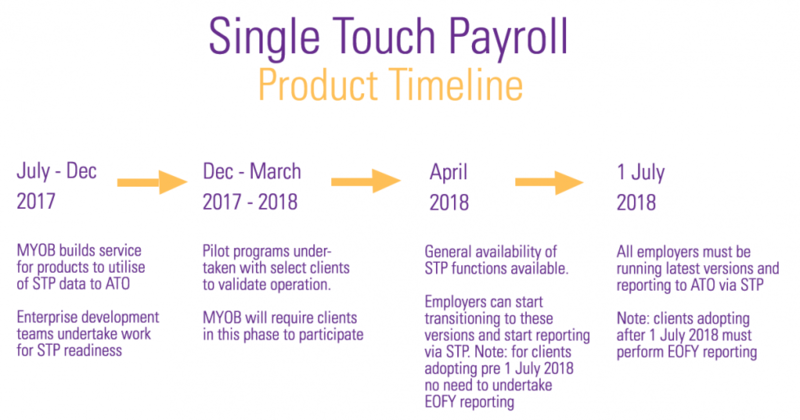 MYOB plan to have Single Touch Payroll functionality ready by April 2018 for an initial rollout to a limited set of pilot customers. An Exo Employer Services Product Upgrade will be available in June 2018 for those considering an early upgrade. The ATO requires employers to count employees on April 1st, 2018 to establish when they must start reporting via Single Touch Payroll. If you have more than 20 employees, as an employer you will have to report through Single Touch Payroll from July 1st, 2018. If you have less than this, Single Touch payroll is optional until 1st of July 2019 when legislation is subject to change. Kilimanjaro will keep their clients up-to-date with the newest information as it becomes available from the ATO as well as product updates with MYOB. We will ensure that all our clients are well informed and prepared for any changes so that businesses can promptly see the benefits of this new system.